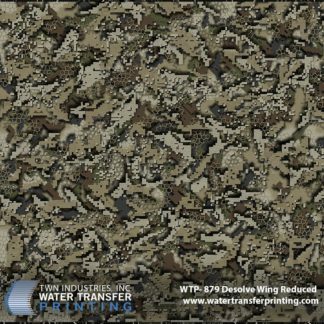 Princeton, FL – October 26, 2016 – TWN Industries Inc., the leading Water Transfer Printing supplier is excited to announce its new Desolve Camouflage hydro dipping films. These patterns are incredibly unique because they focus on the core purpose of any camouflage, to deceive the animals we are hunting, not the eyes of humans. Desolve® Camouflage has been designed with animal science to deceive the vision of Ungulates (Hooved Animals). Traditional mimicry camouflages appear impressive to the human eye at close range, but at ranges of 25m or more it will morph into one solid color, creating a silhouette. Desolve® Camouflage patterns utilize high contrast macro and micro patterns to break up the user’s shape at all ranges. Don’t believe me? Check out this cool animal vision simulator on Desolve® Camouflage’s website…Science! The idea behind Desolve® Camouflage was to create a better pattern that worked in multiple surroundings and multiple ranges. The concept was to look beyond traditional “stick and leaf” patterns that appeal to the hunter at first glance, and create a camouflage that specifically deceived and confused the target’s vision. We sat down with Robert Wilson, Manager of Desolve® Camouflage and picked his brain. We asked about him, his team, and the journey behind Desolve® Camouflage. How Did You and the Desolve Camouflage Team Come Up with the Idea for the Pattern? Our team is a group of extremely enthusiastic hunters. The idea was born from hunting experience where we noticed that camouflage wasn’t breaking up our profile in certain environments. From there we decided to clean our slate of anything we thought we knew about camouflage, and started by diving into the science of vision and thus deeper into animal vision. What Type of People Can Benefit from Using Desolve Camouflage? Desolve Camouflage patterns will appeal to anyone who is serious about concealment. As well as having a new and unique look, there are an endless number of possible applications. 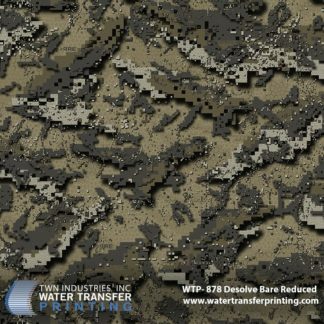 Desolve® Camouflage will be very appealing to serious hunting brands who wish to gain an edge on the competition as well as military application. What Types of Products Feature Desolve Camouflage? Initially, Desolve® Camouflage was seen on hunting garments with tremendous success and acclaim. Recently hard goods manufacturers have adopted the pattern with products ranging from hunting weapons to sunglasses. What Environments are the Desolve Camouflage Patterns Designed For? 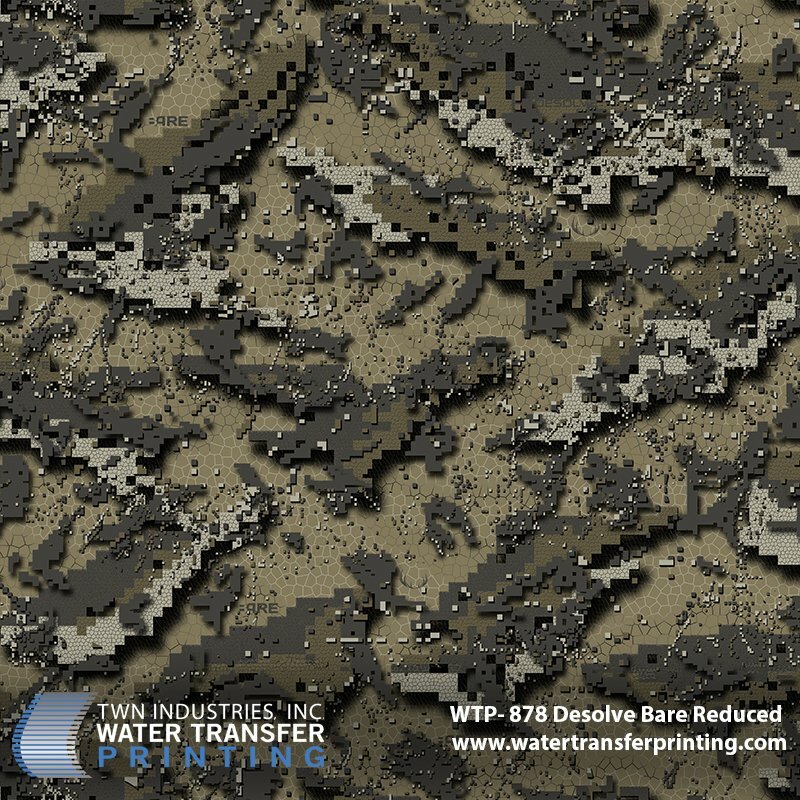 Desolve® Camouflage patterns have very deliberately been designed to work in all conditions. Because the pattern works by breaking up the shape of the user, the 3D effect allows the pattern to appear to be connected to whatever is around it, instead of replicating what is around it. Desolve® Bare Camouflage features enhanced brown tones which enable you to deceive your prey in the leafless undergrowth of the common fall hunting seasons. The coloration of Bare Camouflage is also engineered specifically to blend in with barren environments including desolate high country or the open plains. Desolve® Wing Camouflage has been engineered to disrupt the highly advanced vision of waterfowl while you are hunting in a field of reeds and grasses. Waterfowl possess panoramic vision and zero binocular vision, which means they can detect movement over a wide area but have trouble focusing on specific objects. Desolve Wing exploits their inability to fill in the blanks within their wide-angled vision, and as a result, renders you virtually invisible. Rifles, pistols, pocket knives, and multi-tools. Compound and recurve bows, crossbows, and arrows. Tree stands, binoculars, and game cameras. ATV’s, side by side UTV’s, and other vehicles. The patterns design and current scale make it suitable for eyewear and other small items which normally require a micro or reduced version of a pattern. Desolve® Deception Camouflage Ltd was launched in 2013 by a team of avid hunters looking for a better camouflage than current market offerings. Launch date came after an extensive research and field testing process. Our company is extremely proud of the patterns we have put to market since that date, and we are evolving and improving all the time. Desolve® Camouflage stands for creating a better camouflage to help users disappear. We are a company consisting of an enthusiastic and excited team with a clear goal of producing the best camouflage on the planet. Desolve Camouflage’s goal is to enable the end consumer to select products from industry leaders in various product lines, all sharing the same camouflage. Our vision is that end consumers will be able to select and purchase products to create a camouflage “Super System”. Desolve® Camouflage has licensed relationships with Oakley® and Hunters Element® with many more brands on board and ready for official announcement over the next 12 months. Visit Desolve® Camouflage for more information.